My Scraproom: April - Baby I'm Worth It! April - Baby I'm Worth It! Believe us, it’s worth it! Sign up as a Consultant in April and earn amazing rewards—including a FREE Cricut® collection! 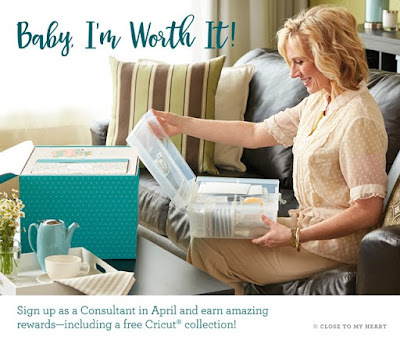 Signing up as a new Consultant with Close To My Heart during April is more rewarding than ever. And only during April, you can also earn your choice of a FREE Cricut® collection or an additional $100 in Select Product Credit when you submit $350 in personal sales within your first 30 days! Just click the "Join My Team" tab at the top of this blog to get started. Offer valid April 1, 2016 (9:00 am MDT) – April 30, 2016 (11:59 pm MDT). Cricut® collections available while supplies last. No tax will be charged on the free item. Shipping/handling will be charged based on the retail value of the free Cricut® collection. Reminder - Baby I'm Worth it!